What you want to know about Stentor, the specialists in Maritime Steel Constructions! Stentor Industries BV is a Dutch company with an ISO9001:2008, ISO14001:2004 and ISO3834:2005 certified production facility in Curcani, Romania. Stentor specializes in quality maritime steel constructions, amongst others for maritime propulsion. Nozzles, Thruster tunnels, Stern tubes and Thruster support components are core products. With an in-house engineering department Stentor is capable of providing fast solutions for numerous other related steel constructions. State of the art equipment, a solid material stock, a broad array of capabilities and an experienced and certified workforce guarantee timely quality solutions with competitive pricing. Stentor origins date back to the early nineties of the last century. In 1992 Stentor Naval, as it was then called, started it activities on the maritime industrial complex of Navol in Olteniţa – Romania. The company was established to produce small luxury yachts and in the decade to follow many of these yachts found its way to satisfied owners all over Europe. In 1996 the first propulsion nozzles were produced on request of the Navol shipyard and following the success of these initial deliveries Stentor nozzles found their way to other customers as well. During the following years the nozzle construction became more and more the Stentor core business. At the start of the century nozzles took over as main product and in 2004 Stentor officially terminated the production of yachts to focus completely on the production of nozzles and other propulsion related products and components. 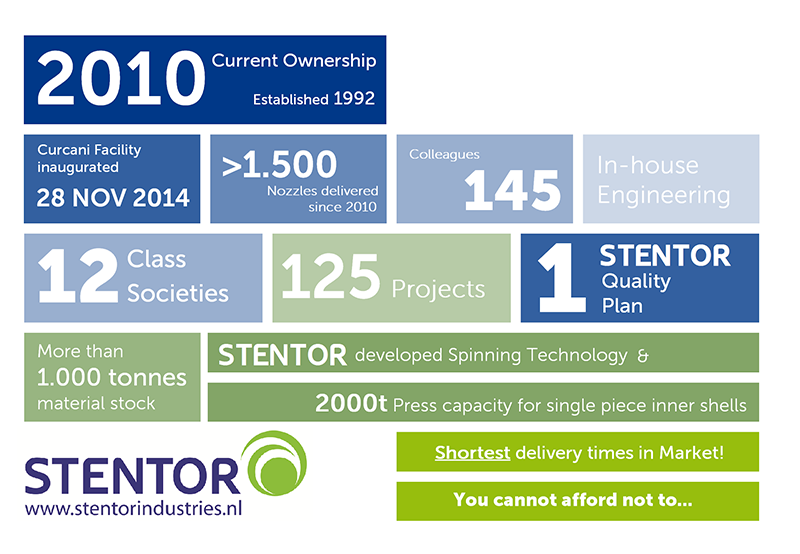 Stentor gained extensive knowledge and experience in all kind of models, diameters and specifications. Today the maritime product portfolio varies from propeller nozzles and thrusters to tunnel thrusters and rudders. In 1996 the first propulsion nozzles were produced on request of the Navol shipyard and following the success of these initial deliveries Stentor nozzles found their way to other customers as well. During the following years the nozzle construction became more and more the Stentor core business. At the start of the century nozzles took over as main product and in 2004 Stentor officially terminated the production of yachts to focus completely on the production of nozzles and other propulsion related products and components. In 2010 the company was acquired by the current management. With an aerospace background the management focussed on improving the overall quality, the delivery reliability and broadening the product range. In 2011 Stentor broadened its portfolio by engaging in the assembly of industrial machinery, taking advantage of the experience in creating large welded constructions and the maritime installation technique. Stentor also introduced its new corporate identity consisting of the bold maritime blue STENTOR and a green swirly logo mark that reflects the constant forward movement of Stentor, the swirl and wake behind a propulsor and the environmental approach Stentor strives to implement in all activities. Early 2012 the first new machinery arrived in Oltenița: two hydraulic bending machines for plates and profiles were installed. The installation of these machines marked to start of an extensive 3 year investment program that would be completed by the inauguration of the new facility in 2014. At the start of 2013 Stentor, supported by a growing market share and by it’s confident shareholders, embarked on a route towards a brand new and state of the art production facility. On 14 October 2013 the first ground was broken on a 22.000m² site, just north of the then current location, in the village of Curcani. With direct access to the DN4 motorway and ample space for expansion in a highly supportive community, Stentor made a significant step toward the future. Early summer 2014 the building was handed over and the installation of all new equipment started. A few months later the production moved and exactly one year after the start of the building activities, on 14 October 2014, the first production hours were recorded in the new facility. On November 28 the factory was officially opened by Stentor CEO, Mr Friso Horstmeier and the Ambassador of the Royal Kingdom of The Netherlands, his Excellency Mr J.H.M. van Bonzel. With this inauguration of the factory and the new dedicated equipment Stentor strengthened its position as the supplier of top-notch quality maritime products. 2015 marked the first full year in the new facility and the succesful introduction of the Stentor developed Spinning technique. Together with the in-house developed pressing method Stentor is now able to deliver all her nozzles with “single” piece insides. Also Stentor delivered the first Lower Gear Houses! In combination with a high quality nozzle Stentor is providing its customers with another service that broadens the Stentor portfolio and underwrites the new Stentor tagline: Maritime Steel Constructions! In the third quarter of 2016 Stentor Steelworks was created as a separate division specialized in steel constructions for non-maritime applications with focus on heavy duty markets. With the addition of wear-resistant material to its portfolio Stentor Steelworks serves high-demanding markets such as recycling, concrete and tarmac production, bulk handling, livestock feed and with a maritime accent: dredging. All components/products are produced under the same high quality regime and can be created from available drawings or can, upon request, be designed and engineered together with the Stentor Engineering department. 2017 could be described as a transition year for Stentor Steelworks; with the abundant capabilities and ample capacity, Stentor was able to attract many new customers from (predominantly) the bulk handling and mining markets. Quite a number of first articles were launched and during the year a series of new equipment was installed: a press brake of 340 tonnes, a CNC milling machine, a NC lathe and last but not least a new pipe bevelling unit. With these additions the capacity expands further to be able to accommodate the increasing requests of the current and new customers. Deliver the right product in the right location on the right moment. 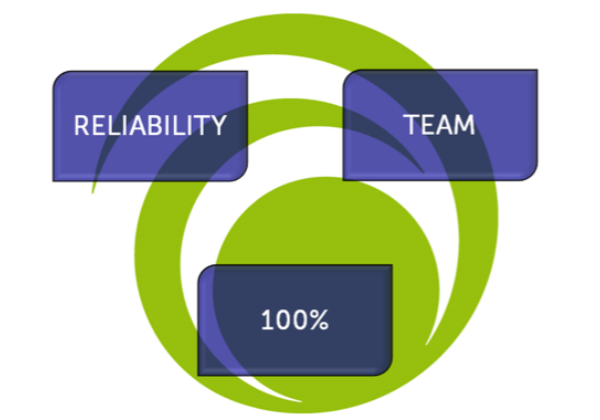 Stentor is guided by our three main values that are derived from the corporate strategy: Reliability, Team and 100%. Quality³: Quality of Stentor people and the Quality of Stentor processes will deliver Quality products. On Time Performance: deliver the right product in the right location on the right moment. Reduce Cost: Continuous improvement and striving to do activities First Time Right in all aspects eliminates all “waste” in the organisation. 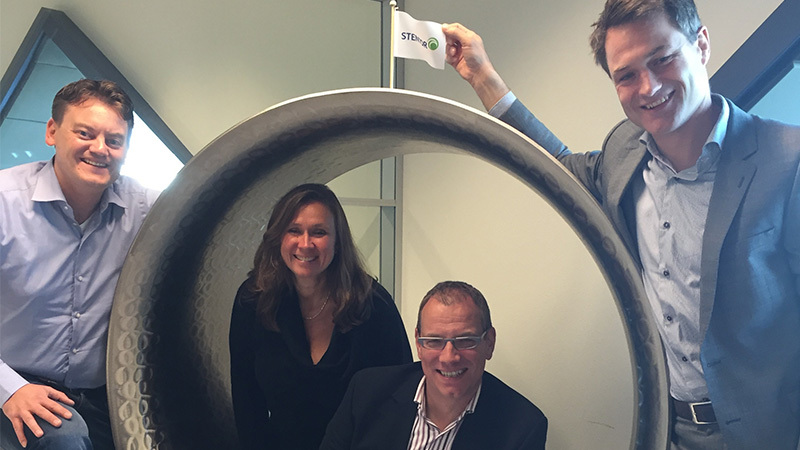 The Stentor Team is diversified and highly qualified in all levels of the organisation. From the engineering team with licenced engineers and naval architects, via production with authorized welders, welding engineers and skilled professionals to the quality department with a broad array of certified in-house NDT-staff. 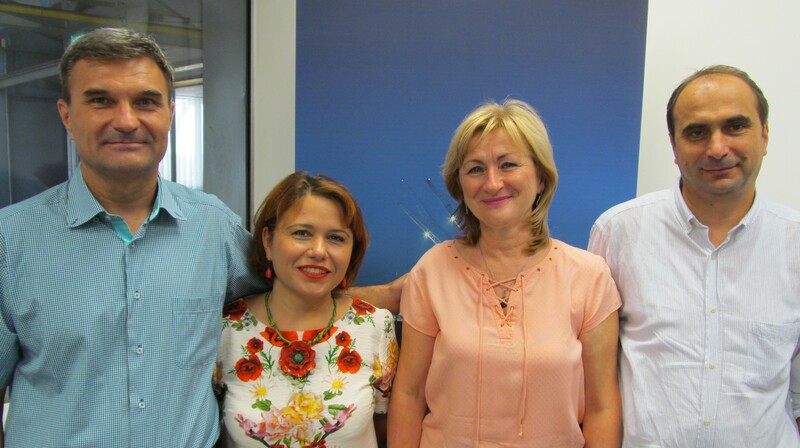 Next to that the Stentor Team is multi-cultural build on Romanian, Dutch and even Canadian nationals. The mix of Romanian technical know-how and skills combined with the traditional Dutch commercial heritage has resulted in high quality products, appreciated all over the world.